Among DeLuise's best-known films: "Silent Movie," "Cannonball Run"
Reynolds: "Dom always made everyone feel better when he was around"
LOS ANGELES, California (CNN) -- Dom DeLuise, who spiced up such movies as "Blazing Saddles," "Silent Movie" and "The Cannonball Run" with his manic delivery and roly-poly persona, has died, his son's publicist said. 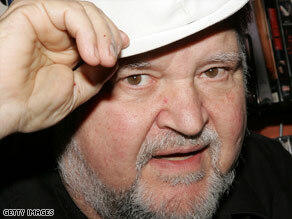 Dom DeLuise was best known for his roles in Mel Brooks films as well as films with his friend Burt Reynolds. Publicist Jay Schwartz did not disclose the cause of death, but DeLuise, 75, had been battling cancer for more than a year. DeLuise was surrounded by family when he died in a Santa Monica, California, hospital Monday night, son Michael DeLuise told CNN affiliate KTLA. DeLuise was most famous for his supporting roles in a number of Mel Brooks films, including 1974's "Saddles" -- in which he played a flamboyant musical director who led dancers in a number called "The French Mistake" -- and 1976's "Silent Movie," in which he played the assistant to Brooks' director Mel Funn. He was also in the Brooks-directed "The Twelve Chairs" (1970), "Spaceballs" (1987) and "Robin Hood: Men in Tights" (1993). DeLuise, who struggled with his own weight, was also an author of cookbooks. In 1991, he told CNN's Larry King that after meeting Luciano Pavarotti while working on an opera, he realized he needed to try to shed some of his weight. "I finally became powerless over food," he told King. "You know, anybody who's an alcoholic or cocaine or something, that's what food was to me." Besides authoring cookbooks, DeLuise penned seven children's books. DeLuise was also part of the supporting cast in the Burt Reynolds crash-'em-up vehicles "Smokey and the Bandit II" (1980), "Cannonball Run" (1981) and "Cannonball Run II" (1984). Other DeLuise films include "The End" (1978), "The Best Little Whorehouse in Texas" (1982) and "Johnny Dangerously" (1984). His voice was featured in such films as "An American Tail" (1986) and its sequels, "All Dogs Go to Heaven" (1989) and its 1996 sequel, and "Oliver & Company" (1988). DeLuise had three sons -- Peter, Michael and David -- who all became actors. He told Larry King that it was the "joy of my life" to work with his oldest son, Peter, when he directed the film "Second Nature." His wife of 40 years, actress Carol Arthur, appeared in several movies with him, including "Blazing Saddles" and "Silent Movie," according to DeLuise's Web site. DeLuise worked closely on several films with pal Gene Wilder, who in 2002 told Larry King that of all of his co-stars, DeLuise "makes me laugh the most." A frequent collaborator with DeLuise, Burt Reynolds released a statement to "Entertainment Tonight" on his friend's death. "I was thinking the other day about this. As you get older you think about this more and more, I was dreading this moment. Dom always made everyone feel better when he was around. I never heard him say an unkind word about anyone. I will miss him very much," Reynolds says.